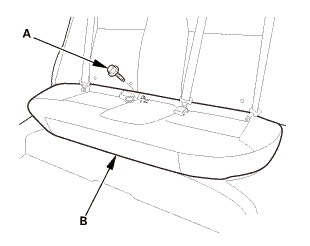 The driver's seat is shown; repeat on the passenger's seat. 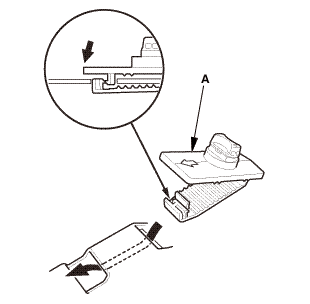 Prepare a sheet of cardboard which is 2-2.5 mm (0.08-0.098 in) thick. 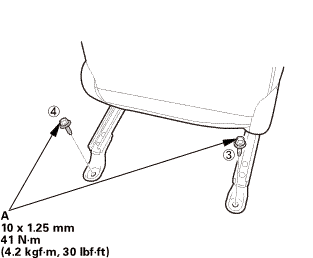 NOTE: If there is no suitable cardboard, put some seats of thin paper together until they will be required thick. 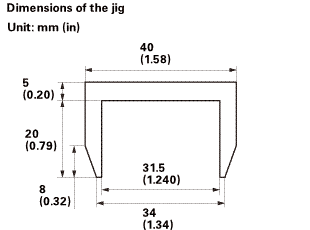 Make a jig (A) from the prepared cardboard (B). 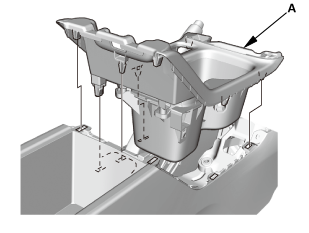 Slowly insert the jig (A) into holes (B) in the back of the lap connector cover (C) to release the sublatch spring (D). 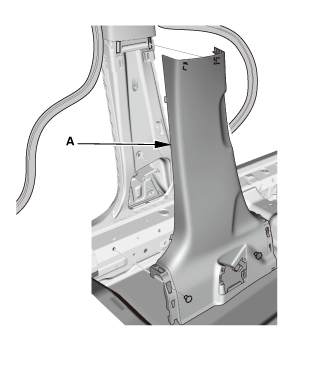 Be sure the jig is inserted vertically. 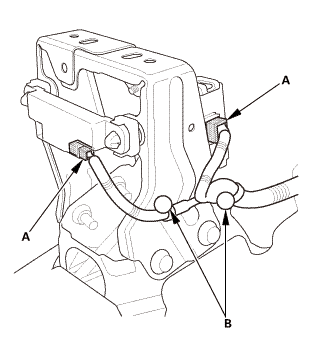 Leave the jig (A) set in the lap connector cover (B) to keep the sublatch spring (C) open. Carefully insert the tip of a small screwdriver (D) into the hole in the lap connector cover, and unlock the lap connector by pushing in on the screwdriver. 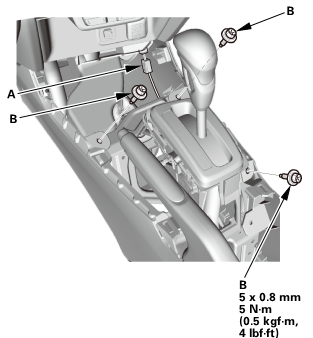 While pulling the front seat belt (B) upward, remove the screwdriver (C). 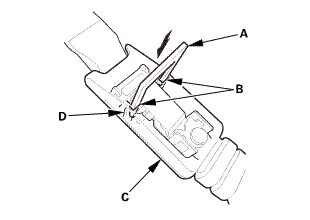 As soon as you remove the screwdriver from the lap connector (D), the anchor connector will come off the lap connector. 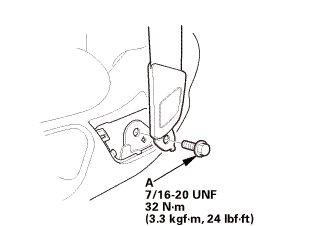 Remove the seat mounting bolts (A). 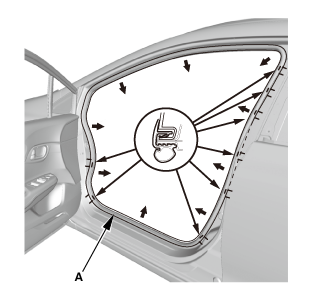 With the help of an assistant, carefully remove both front seats through the front door opening. 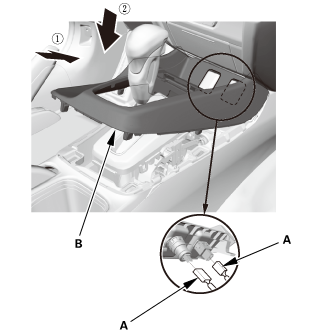 Driver's side: Remove the cap (A) from the front door sill trim (B). 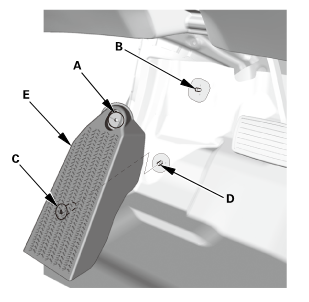 Driver's side: Remove the opener lock cylinder (C). 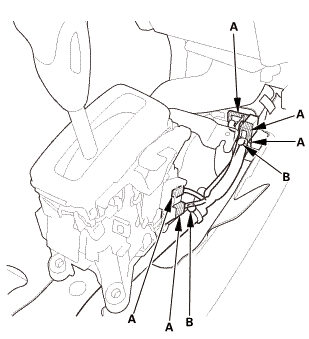 Driver's side: Remove the screw (A). 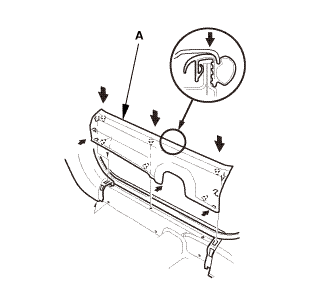 Remove both front door sill trims (A). 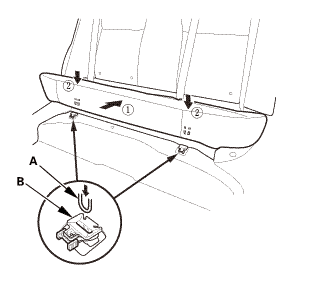 Pull out both front door opening seals (A) as needed. 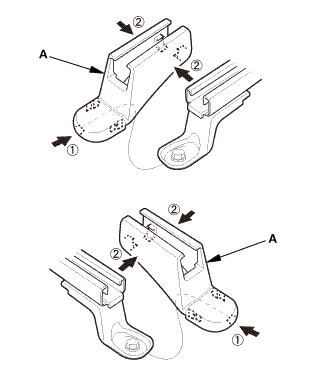 Remove both kick panels (B). 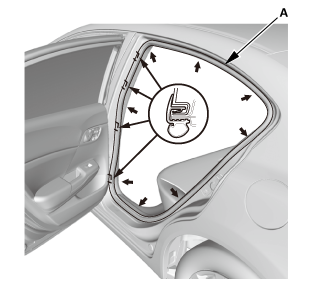 Remove front door opening seal (A) as needed. 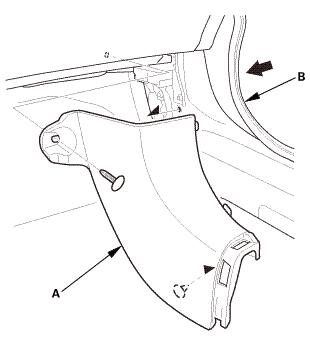 '13 Model (driver's side): Remove the B-pillar lower cover (A). 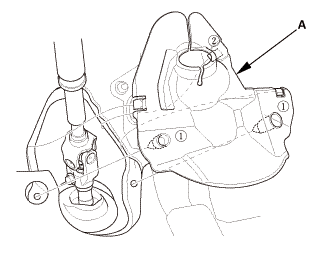 '12 Model: The left side is shown; repeat on the right side. 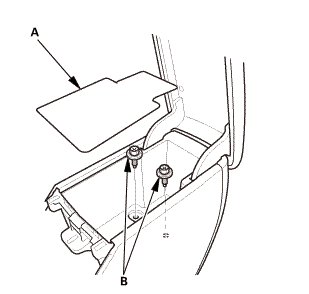 Remove the center console panel (A). 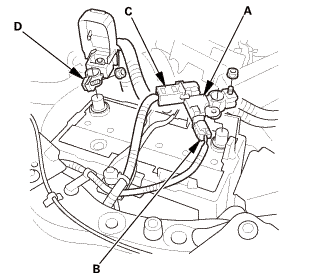 For some models: Disconnect the connector(s) (B). 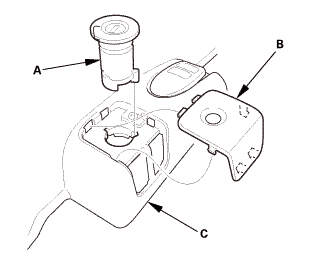 Remove the cup holder panel assembly (A). 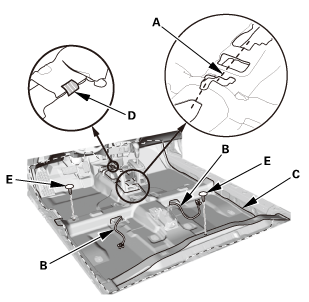 Remove the console box mat (A). 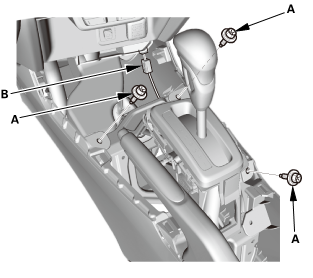 Remove the center console (A). Remove the steering joint cover (A). 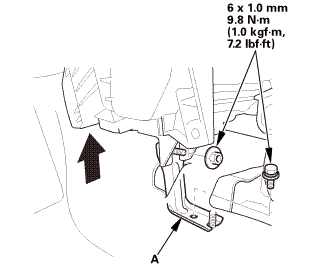 For some models: Remove the lower clip (A) from the stud bolt (B) with a 6 mm hex socket wrench. 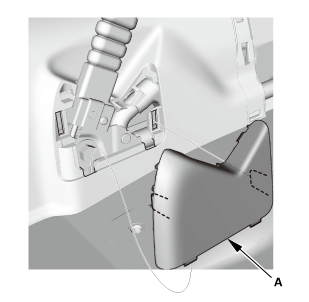 For some models: Remove the upper clip (C) from the stud bolt (D) with a flat-tip screwdriver, then remove the footrest (E). 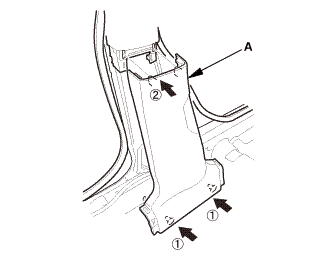 Remove the HVAC bracket (A). 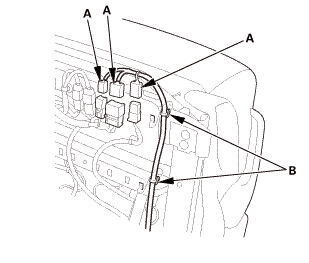 Disconnect the connectors (A) and the harness clips (B). 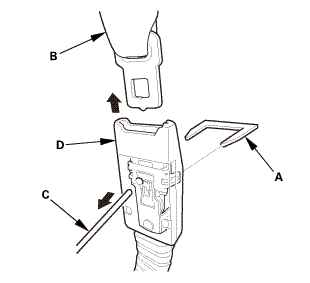 Disconnect the connectors (A), and detach the harness clips (B). 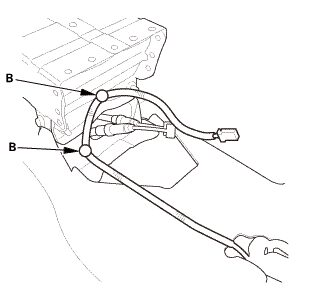 Release the hook and loop fastener (B). 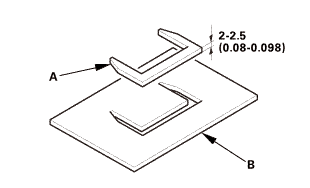 Cut the carpet (C) in the area (D) as shown. 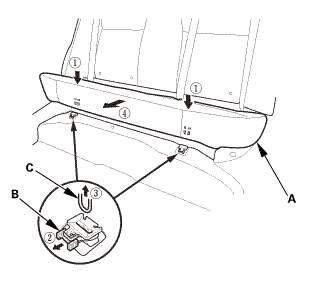 Pull out the seat harnesses (E), then remove the carpet. 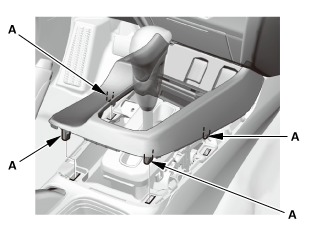 If necessary, remove the floor mat holder (A). 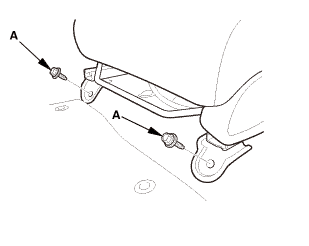 If necessary, install the floor mat holder (A). 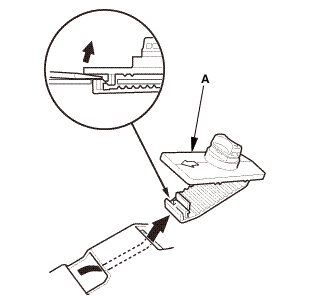 When installing the new carpet, cut the carpet in the area (A) as shown. 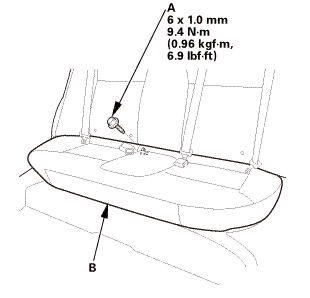 Pass the seat harnesses (B), then install the carpet (C). Install the hook and loop fastener (D). 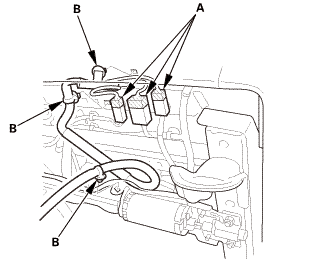 Connect the connectors (A), and install the harness clips (B). Connect the connectors (A) and the harness clips (B). Install the HVAC bracket (A). 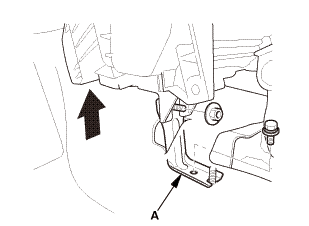 For some models: Install the upper clip (A) to the stud bolt (B). 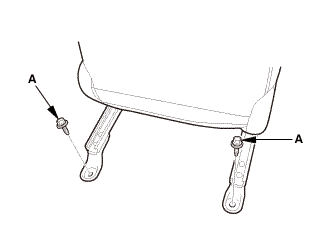 For some models: Install the lower clip (C) to the stud bolt (D), then install the footrest (E). 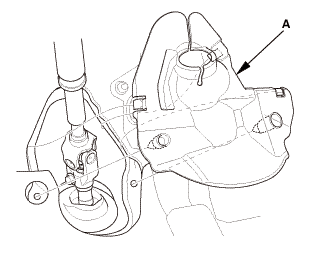 Install the steering joint cover (A) in the sequence shown. 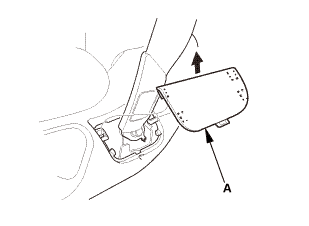 Install the center console (A). 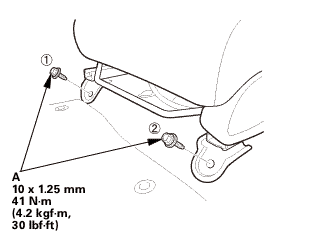 Install the console box mat (B). Install the cup holder panel assembly (A). 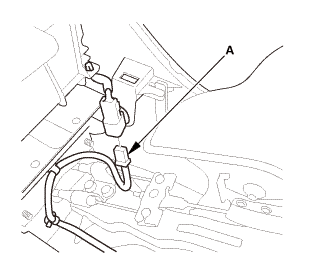 For some models: Connect the connector(s) (A). 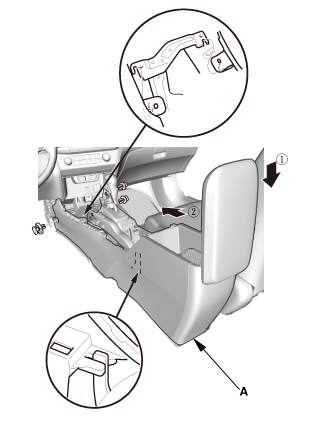 Install the center console panel (B). 12 model: The left side is shown; repeat on the right side. 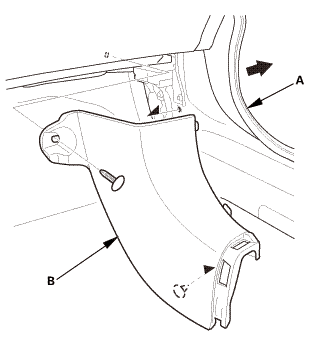 13 model (driver's side): Install the B-pillar lower cover (A). 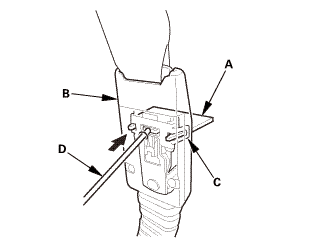 Install front door opening seal (A). 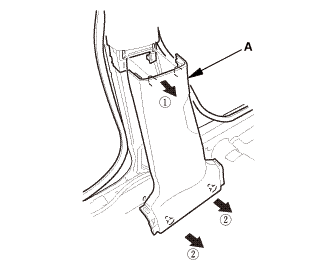 Install both kick panels (A). 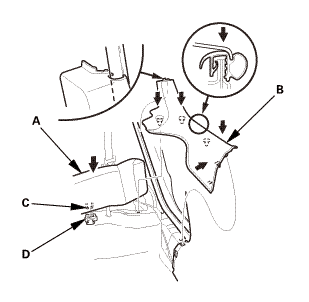 Install both front door opening seals (B) as needed. 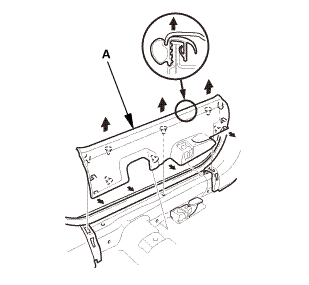 Install both front door sill trims (A). 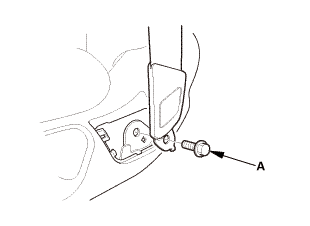 Driver's side: Install the screw (A). 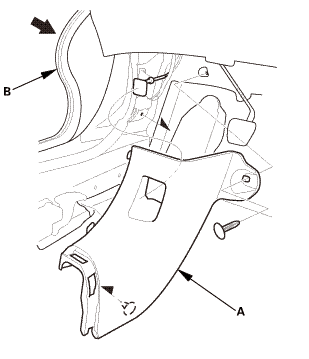 Driver's side: Install the opener lock cylinder (A). 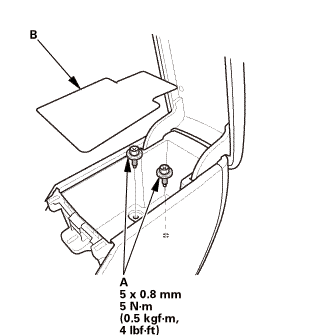 Driver's side: Install the cap (B) to the front door sill trim (C). With the help of an assistant, carefully install both front seats through the front door opening. 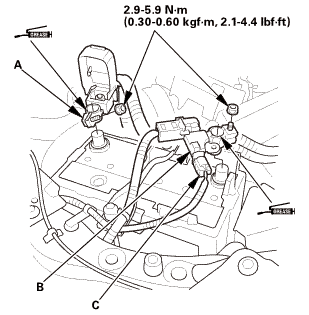 Install the harness clips (A). NOTE: Tighten the bolts to the specified torque in the sequence shown. 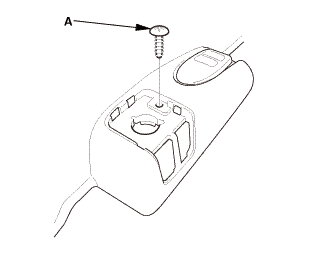 Tighten the bolts by hand first, then tighten them to the specified torque. 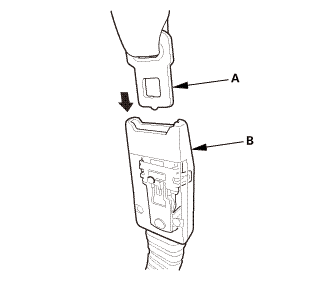 Install the front seat belt lower anchor (A) to the front seat belt lap connector (B).